Laura B. Eisenstein, associate professor of physics, was an outstanding young biological physicist who made important discoveries about light energy transduction mechanisms by biomolecules, using a variety of techniques, including time-resolved resonance Raman and X-ray absorption spectroscopies. 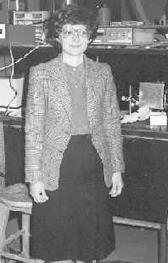 Professor Eisenstein served our Department and the biological physics community with distinction from 1969 until her untimely death. A native of New York City, Eisenstein held degrees from Barnard College, Columbia University, and Harvard University. She joined the Department of Physics at Illinois in 1969, working first in high-energy physics and then in biomolecular physics. In 1985, she was elected a Fellow of the American Physical Society for her "contributions to the understanding of biological molecules and molecular assemblies from a physical viewpoint through spectroscopic studies of transient phenomena." She had led investigations of the protein bacteriorhodopsin in collaboration with scientists at the University of California and in Europe. During 1973-74, she was a NATO postdoctoral fellow at the Institut de Biologie, Physico-Chimique, Paris. Eisenstein served for five years on the APS committee on the Status of Women and chaired the national group during 1983-84. She was also a member of the executive committee of the APS Division of Biological Physics and was an officer of the physics section of the American Association for the Advancement of Science. She was a member of the editorial board of the Biophysical Journal from 1982 until her death.